It used to be nigh on impossible to get in the door here on matchday but they’ve since expanded out the back & upstairs & the place is now huge so we’ve made it our matchday watering hole (when not drinking cans while basking in the sunshine on the Beggar’s Bush grassy knoll of course). The match this time round was Ireland – Georgia on a Monday night so the first pints were late afternoon. The pour was exellent, the pint settled just right. Nice bit o’the cream, good taste, decent lastability; very drinkable, as it should be. 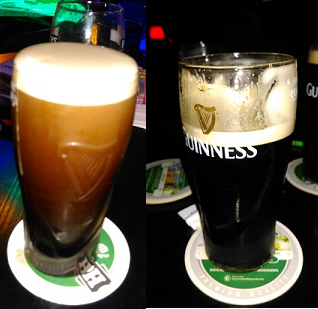 Post-match I returned & ordered from the same bar (upstairs) but was served by a different barman &, again, the pour was excellent & the pints just lovely. The decent creaminess & good head retention can be seen in the 2nd pic below: looking good. I must add that on busy match days the pints come in plastic glasses & they’re still fairly decent. I like drinking Guinness here; a high 3/4.